Tonight on NBC their hit reality talent show AMERICA’S GOT TALENT returns for the seventeenth episode in its ninth season and on tonight’s show the top 24 acts are revealed who will move on the the Semi-final round. On the last episode, Judging was turned over to the American viewing audience as the last twelve of the Top 48 acts performed live at Radio City Music Hall for the chance to win the $1 million prize and become the most talented act in America. One Voice Children’s Choir was one of the acts that performed and they were confident that they could amaze the judges. Sadly, Howie was not that impressed and he was a big fan before this performance. Did you watch the last episode? If you missed it we have a full and detailed recap, right here for you. On tonight’s show, the top 24 acts are revealed in a results show. America’s votes are in, and five acts from the previous night’s performance show will move on to the semi-finals. Nick Cannon hosts this variety competition series which features a colorful array of performers hoping to be named the most talented act in America. 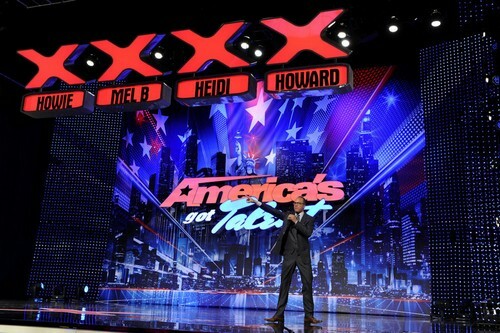 Howard Stern, Mel B, Heidi Klum and Howie Mandel star. We now get a recap of all the acts that performed last night, giving us a reminder on the very tough choices they had to make; there are so many great acts but very few of them will be moving on to the next round. From the good and the disappointing, America has its hardest selection of acts to choose from tonight. Mel B says last nights show was so emotional and very powerful, she believes they have the best television show in the entire world; she has no clue on who America could have chosen to move on from last nights performances. We now get a look at the Reddi Whip after party event, where Nick is hanging out and talking to all the contestants about their performances last night; they are all confident about what they have done and leave it all into America’s hands on whether their dreams become closer to a reality or crushed tonight. The first act going into the semi-finals is Emil and Dariel for their incredibly impressive and emotional chello performance, they can’t believe they are moving on. Mel B says that they need to keep doing what they do, there isn’t anything to change; just keep bringing out their amazing performances. The next act going on to the semi-finals is Jonah Smith for his incredibly moving and emotional singing performance he did last night, Jonah introduces his band and is very happy to be moving on. Howard says that he is the real deal, the guy can really sing and his band is superb; their classic rock genre is perfect and he’s happy with them moving on. The next act moving on to the semi-finals is Quintavious Johnson for his insane singing performance that made the audience and the judges give a standing applause. Heidi says that he is a rock-star and believes that he could win this all with his stage presence and powerful voice. Next up is comedian Taylor Williams the runner up of last years America’s Got Talent is performing on stage. Now coming on stage is The Illusionists, a group magicians and one of them was evne a contestant on America’s Got Talent one year. The next act moving on to the semi-finals is Smoothini, he did a small magic trick last night and he never expected to go through; he truly felt he did no do enough and is very grateful for this next shot to prove America. Howie says he’s very happy about this and the point was from where he was sitting he was amazed by the act; he knew America at home would enjoy it. The two last acts left to the judges choice to move on are Kelli Glover and One Voice Children’s Choir, we get another look at their performances last night to give the judges a little reminder of what they are judging on. Mel B says that it’s so difficult because she likes both acts a lot, the Children are so amazing and probably only got through with their song choice; though they sang it well. She loves Kelli and her passion for music, she decides she’s going with Kelli. Howard says that he believes both acts are strong and feels the Children have to coneect with the audience more, he decides he’s going with Kelli Glover. Howie says he loves Kelli and her great story, he’s also a big fan of the Children and believes their song was great; Howie chooses Kelli Glover is moving on to the next round.